Father Christmas as we know him today, a jolly older man with a long white beard, red cloak with hood, sack of gifts and sometimes a rod, is the temporary end in a long history of the development of this figure. Earlier portrayals do not show him dressed in any particular way. Father Christmas is given a new unifying form in the mid-19th century. It was Moritz von Schwind who created the model of the gift bringer figure instantly adopted by the “trendsetting” bourgeoisie for an illustrated story in the Münchener Bilderbogen series in 1847: the character of “Mr Winter”. 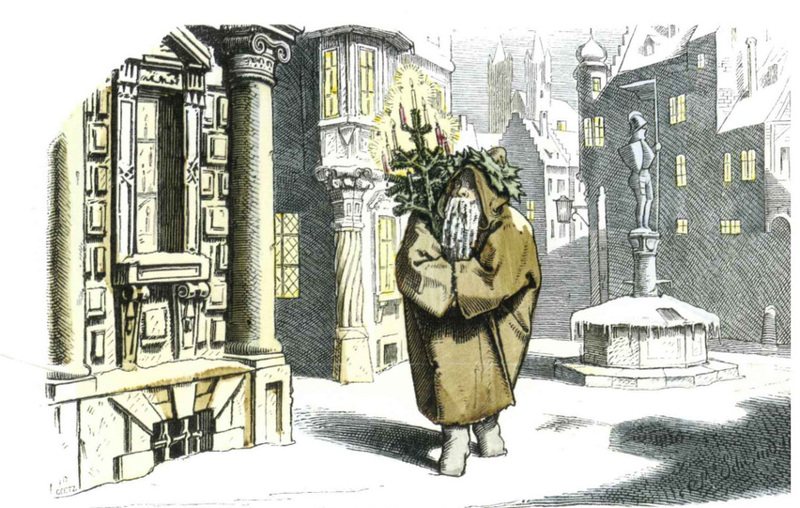 In this illustration he has a full beard, is dressed in a long hooded cloak and roams through the city’s streets with a Christmas tree. Towards the end of the 19th century the illustrations of Father Christmas are based more and more on the model of “Mr Winter” by Schwind. In illustrations and as figures he is portrayed as really grim looking, in a long and baggy often fur-trimmed hooded cloak that is brown, lilac, green, black, white, blue, orange or red until around the turn of the century. At first, he was also depicted with the Christmas tree decorated with lights. Soon he was also given a rod and sack of gifts as a prop and gradually took over both the rewarding and punishing duties of Saint Nicholas, which fitted into the bourgeoisie educational concept of that time really well. Father Christmas’s nature is always kind and helpful. In this form he becomes a symbol for Christmas. Around 1900 the red hooded cloak, reminiscent of Saint Nicholas’ purple Bishop’s cloak, is established and concludes the establishment of both figures into a “new” Father Christmas. Due to European emigrants there were many national varieties of the Christmas gift bringer and his name in the USA, who acted alongside each other. The blending of portrayals and customs could be witnessed, which were gradually unified into a totally new version of Father Christmas. This was called “Santa Claus” as a reminder of the first gift bringer, a translation of Saint (= Santa) Nicholas (=Claus). 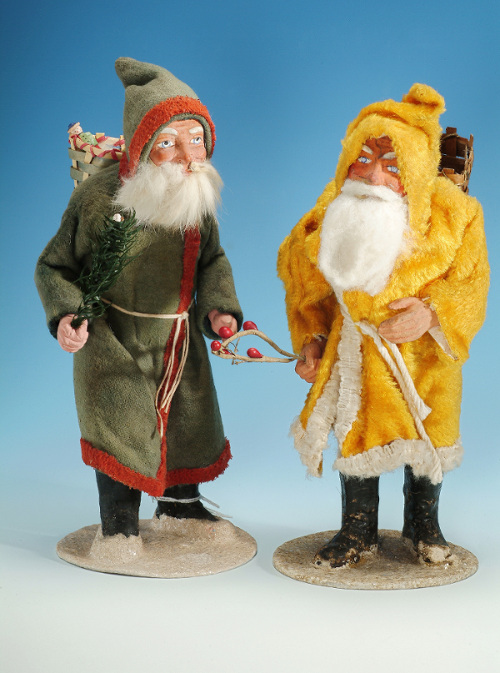 He differs slightly to the traditional German Father Christmas due to his different clothing (short jacket with wide leather belt, baggy trousers tucked in high boots, separate hat) and the lack of a punitive function (therefore always portrayed as smiling). 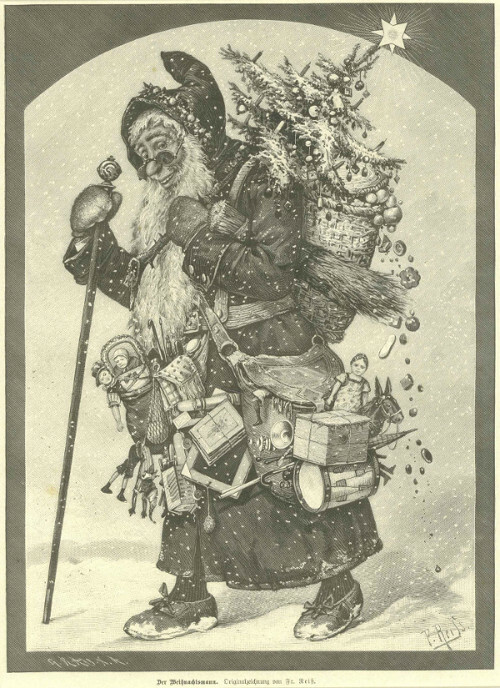 It was mainly the illustrators Thomas Nast and Haddon Sundblom who contributed to the development of Santa Claus from the German figure of Father Christmas.